Antibodies are glycoproteins that specifically recognize antigen. They’re produced by cells of the immune system - called B cells or plasmocytes - in order to block and neutralize foreign agents while infection occurs. In case of auto-immunity diseases (e.g. diabetes, lupus…) antibodies are secreted against host molecules, and are consequently named auto-antibodies. Antibodies are part of the immunoglobulin family, composed by 4 chains of amino-acids : two light chains and two heavy chains, shaping a Y letter. Each light chain consists of a constant domain and a variable domain; heavy chains are composed of a variable fragment and three or four constant fragments according to the isotype. For a given antibody, the two heavy chains are identical, likewise for the two light chains. The association between a variable domain carried by a heavy chain (VH) and the adjacent variable domain carried by a light chain (VL) constitutes the site of recognition of the antigen, called paratope. As for the portion of the antigen that is specifically recognized is named epitope. Thus, an immunoglobulin molecule has two antigen binding sites, one at the end of each arm. These two sites are identical (but intended for different epitopes), hence the ability to bind two molecules of antigen by antibody. What is the antibody isotype? 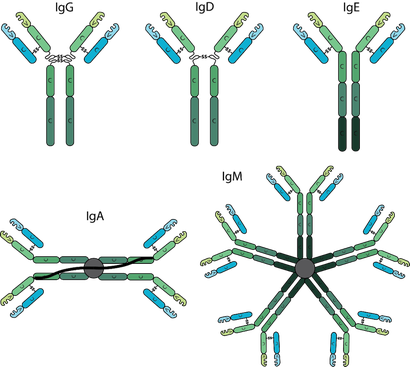 The isotype of an antibody refers to its class. In fact, antibodies are divided in class and subclasses depending on their structure of their heavy chain. A different structure of an antibody affects directly its valence, its means the number of epitopes the antibody is able to recognize. The γ, α, μ, ε and δ chains correspond respectively to IgG, IgA, IgM, IgE and IgD immunoglobulins. There are also subclasses of immunoglobulins, reflecting finer differences between heavy chains, and being radically different for each species. The human thus has four subclasses of IgG and two subclasses of IgA, whereas rat and guinea pig species have only two subclasses of IgG, and rabbit present only one subclass of IgG but fourteen IgA subtypes ! There are also light chain isotypes, which can be κ (kappa) or λ (lambda). Isotype controls are a type of negative control designed to measure the level of non-specific background signal caused by primary antibodies. They match the class and type of the primary antibody used in your application, and lack the specificity for your antigen. Ideally, the isotype control should match the species, the heavy chain, subclass and light chain of your primary antibody. If using a directly labeled primary antibody, it is important to select an isotype control conjugated to the same fluorochrome. How is the antibody diversity generated? Antibodies are encoded by V, D and J genes undergoing recombination in B cells. This recombination is, in association with the phenomena of somatic hypermutation and junctional variability, the source of their diversity. The B cell leaves the bone marrow without ever having seen the epitope of its antigen: the specificity and the affinity of the membrane antibody, and consequently of the circulating antibody produced, are determined before the encounter. To adjust these parameters to the antigen initiating a humoral mediated immune response, the activated B cell clone will initiate somatic hypermutation: the genetic recombination at the origin of the immunoglobulin produced will undergo mutations in its sequence which will adjust the hypervariable regions to the epitope. Mutations take place on the variable segments of the light and heavy chains. This phenomenon mainly participates in the modulation of the affinity of the antibody for its epitope: the lymphocyte B whose membrane immunoglobulin has a low affinity for an antigen may, without recruiting another B lymphocyte, increase the affinity of the antibody. Occurring in all species, the mechanism of somatic hypermutation can be coupled with another phenomenon in rare cases : gene conversion. In guinea pig species for instance, we observe the non-reciprocal transfer of sequence information. The exchange can be between a pair of non-allelic sequence (in this case we speak of gene conversion), or between a pair of allelic sequence (in this case we speak of an interallelic gene conversion). 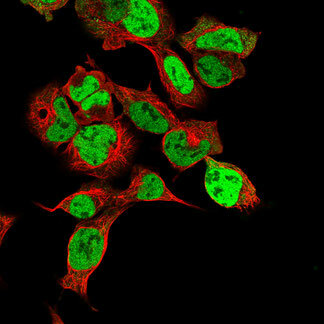 Discover unique guinea pig antibody repertoire! A monoclonal antibody recognizes only one epitope of a given antigen and comes from only one single B clone. The polyclonal antibodies are a mixture of antibodies recognizing different epitopes on a given antigen, each idiotype being secreted by a different plasmocyte. During the immune response, an organism synthesizes antibodies directed against several epitopes of an antigen: the answer is called polyclonal. In vivo, meaning in animal, the response is always polyclonal. Do you know that SYnAbs can offer both monoclonal and polyclonal antibodies? Which cells can produce antibodies? Producing monoclonal antibodies in vitro has long been difficult, because of the short life of antibody-secreting cells, the B cells. The antibodies were then obtained in vivo by injecting the animal with a given antigen and collecting the antibodies in its blood or ascites after intraperitoneal injection. This method gave antibodies but polluted by many impurities. In the late 1970s, César Milstein and Georges Köhler developed the hybridoma technique in mouse, while Hervé Bazin developed the hybridoma technique in rat species thanks to unique proprietary myeloma cell line. Hervé Bazin is at the origin of SYnAbs company. The antigen is injected into the animal, and spleen cells are removed after a few weeks. In these cells are plasmocytes secreting antibodies directed specifically against the selected antigen. These plasma cells are then fused in vitro with myelomas (or fusion partners) - by electrofusion or PEG adding - which are tumor cells with the property of multiplying indefinitely. Do you know SYnAbs can produce several grams per year of your mAb reference in hybridoma cell culture? The hybrid cells obtained (called hybridoma) are selected and then multiplied in a suitable culture medium. After limit dilution, they produce monoclonal antibodies, very pure and in large quantities. The key of hybridoma stability is to fuse myeloma cell line and B cell coming from the same species to avoid any chromosomal aberration and to ensure the generation of high producer clones. This is why SYnAbs has developed its own rat and guinea pig myeloma cell lines to create homo-hybridoma cells only. Genetic engineering today makes it possible to produce monoclonal antibodies that can be used in human clinical practice. 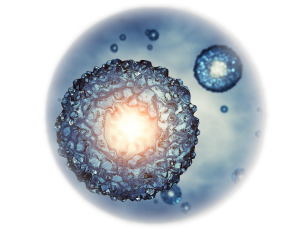 The easiest system for expression of mammalian proteins remains the human embryo kidney cell line 293 (HEK 293). Despite the fact that creation of high producer expression system has been continuously improved, it is still too time-consuming and expensive for research applications, or if large numbers of individual antibodies have to be produced for screening purposes. In this case, transient antibody expression in HEK cell line is much more suitable because it allows fast and parallelized production without any need to generate stable producer cell lines. We add that transient mammalian antibody production can be easily scaled up by employing batch or fed-batch mode during UpStream process and finally generate grams of desired monoclonal antibodies or recombinant proteins. The human embryonic kidney (HEK) 293 cell lines have been widely used for transient recombinant protein expression because they can be very efficiently transfected with plasmid DNA using polyethyleneimine (PEI) or calcium phosphate. This cell line also has several derivatives incuding HEK-293T that stably expresses the simian virus 40 (SV40) T-antigen, or HEK293E transformed with the Epstein Barr virus (EBV) nuclear antigen 1 (EBNA1). While hybridoma cell lines are sufficient for producing small amounts of monoclonal antibodies, a lot of limitations arise when we start speaking about large-scale commercial manufacturing. When evaluating possible expression systems for monoclonal antibodies production, several factors need to be taken into account. First, they need to easily be genetically modified in order to ensure high productivity capacity and high success rate during stable transfection step. Then, these host cell lines have to confer the proper post-translational modifications of folded recombinant proteins. At last, the chosen expression system has to be safe and not susceptible to adventitious agents. 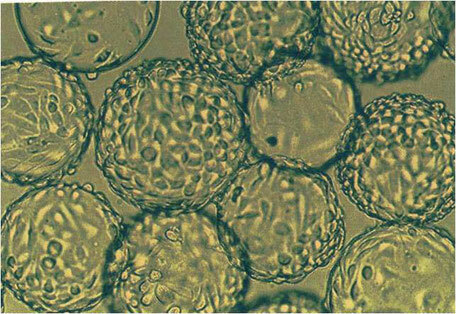 Through many years of experimentations with CHO cell lines since 1919, it appears they met several of these requirements, also with the ability of fast cell culture scaling-up. The first product produced in CHO cells, approved in 1987, was a recombinant therapeutic protein manufactured by Genentech called Activase ; the yields were around 100 mg/liter and the media in which the cells grew contained animal products, such as fetal bovine or fetal calf serum. Today, many blockbusters are produced in CHO cell lines, including Humira (adalimumab), Enbrel (etanercept), Rituxan (rituximab), Avastin (bevacizumab), Herceptin (trastuzumab), Erbitux (cetuximab), Xolair (omalizumab), Orencia (abatacept), Actemra (tocilizumab) and Xgeva (denosumab). Serum free media and animal component free media for this particular expression system are continuously monitored as well as oxygen levels, CO2 levels, and waste product. This information combined with improvements in cell engineering has led to more productive cell culture with average production yields from 2-6 grams/liter. How long does it take to generate a monoclonal antibody? A classical project for the generation of a new monoclonal antibody will take an average of three to four months. 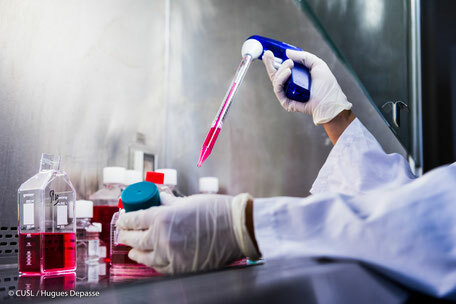 After an in-depth analysis of the targeted antigen, SYnAbs start the project with the generation of the antigen if needed, or the subcontracting of chemical synthesis or small peptide generation with our partner. The customer can also provide the antigen if this option is chosen. Depending of the antigen, SYnAbs offers different species (mouse, rat, guinea pig) and immunization routes. After injection, the immune serum will be tested at day 30 with an ELISA and the best-immunized animal will receive a third immunization and the fusion will be done with this animal after 8 weeks. Fusion of the splenocytes or the poplitea lymph nodes cells will be done by electrofusion with proprietary IR-983, SYn SP2O fusion cell line depending of the chosen species. After the fusion, the cells are dispensed in 96 well plates (between 10 to 20, depending on the initial number of cells). About 2 weeks later, hybridom begin to appear in wells. When the cells are in confluence and the medium yellow, the supernatant is tested by ELISA. During the next 4 weeks, the clones will be firstly screened by ELISA on different antigens depending on the specific requirements of the project (cross-reactivity,…) and a maximum of 20 positives clones are kept and stored in nitrogen. The selected clones, will be finally subcloned by limit dilution and adapted in medium. What are the different antibody formats available? Greg Winter's team demonstrated in 1989 that it was possible to obtain affinities of the order of ten nanomolar using only the variable domains (V) VH (H for heavy chain) of mouse antibodies obtained by in vitro selection from immunized animals. The authors created for the occasion the term dAb for single domain antibodies. They already mentioned the property of these dAb to target epitopes inaccessible to conventional antibodies. This discovery remained anecdotal until 1993 when a team demonstrated the presence of conventional antibodies but also antibodies devoid of light chains and CH1 domains (C for constant domain) in the serum of camels. These antibodies called HcAb for heavy chain only antibodies bind their targets by a single variable domain named VHH to differentiate it from conventional VH. By reference to their small size, camel dAb, considered as the smallest active antibody fragments, are sometimes called nanobodies. It should be noted that all camelids, including camels, llamas and vicuñas, express this type of antibody. In parallel, similar antibodies have also been found in some types of sharks. They are then called Ig-NAR (for new antigen receptor) and their only variable domain is called V-NAR. Subsequently, several teams have developed antibody engineering approaches that first partially confer the properties of lama dAb to human VH (camelization) by substitution of key residues, then finally select in vitro from large libraries of human VH or VL (L for Light Chain) optimized domains, human dAb whose stability and expression performance properties were close to those of natural dAbs. the others as a "framework" of construction starting from which more complex molecules could be elaborated. In soluble form, this small molecule dAb has the advantage of being able to penetrate the tissues much more efficiently than a whole antibody, and especially in solid tumors. However, since the nanobodies are smaller than the filtration limit of the renal glomeruli, they are rapidly eliminated in the urine. To avoid this problem, a first approach is to chemically couple a molecule of PEG (polyethylene glycol) to dAb (PEGylation). A much more elegant solution is to fuse a dAb of interest to another dAb affine for albumin, a protein that is very abundant in the serum, thus conferring on the fusion protein a much longer half-life, depending on the Affinity of anti-albumin dAb. Finally, another solution is to multimerize the dAb, so as to simultaneously increase the molecular weight and the apparent affinity of the resulting molecule. The use of these "dAb modules" also makes it possible to create multivalent and multispecific molecules capable, for example, of retargeting cells of the immune system towards target cells. An important property of dAbs is their ability to maintain their stability in the absence of a disulfide bridge, unlike most conventional fragments such as scFv (single chain variable fragment), VH domain linked to the VL domain by a peptide of linkage.